The 1st of October marks the start of Tyre Safety Month, and with more than a quarter of us driving on tyres that are illegal, it has never been more important to check them. 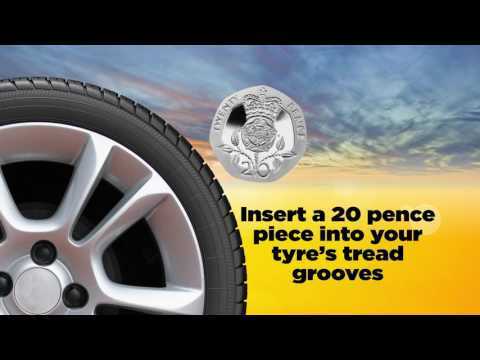 The tread depth of your tyres has a huge influence on the way your vehicle will accelerate, brake or turn corners so having the correct tyre depth will significantly reduce risks to you, your passengers and any other road users. Driving with illegal tread depth not only reduces your safety on the road, but it will also risk a fine of up to £2,500 and 3 penalty points for each illegal tyre - reach 12 points and you will immediately lose your license. 1) Check your tyre's Air pressure, Condition and Tread depth at least once a month to make sure they're legal. Air pressure guidance will be available in your handbook or on the manufacturer's website. The legal limit for tread depth is 1.6mm however the deeper the tread the more grip you have on the road surface. We recommend looking to change your tyres once the tread depth reaches 3mm. 2) Contact your local Vantage centre, where we're offering you a Free Tyre Safety Check to help you make sure your tyres in in the right condition. To find your nearest centre, contact us. 3) With winter fast approaching, the safety of your tyres has never been more important. Check out our Winter Check offer here. Follow us on Twitter or Like us on Facebook to keep up to date with regular vehicle safety advice and lots of other exciting updates.